Who else has fallen in love with beautiful macarons? This tasty little treat which is popular in Parisienne cafes has recently become all the rage in Sydney. When I saw a Macaron Making Party offered by Paris International Cooking School, I decided to round up some friends and spend an evening learning how to make these delightful little concoctions that I enjoy eating so much. Because I'm gluten free macarons are also a guilt free experience as they are made solely with almond flour. Finding a gluten free recipe for sweets is like hitting the jackpot. Paris International Cooking School (PICS) is tucked away on Paramatta road in Stanmore. Inside it's very charming and brings about a feel of old world Europe. The presenter and head teacher of PICS Laurent Villoing was quick to greet us when we entered. Laurent has an impressive career as a chef, originally from France he has over twenty years teaching experience and among his many accolades he was Head Chef in London with the ACCOR group and has catered for royal families including the late Queen Elizabeth. So we knew we were in for the real deal with Laurent, an authentic French chef teaching us how to make macarons. Up to fifteen students can attend the two hour demonstration and tasting, and chairs are faced forward so we can all see what Laurent is cooking. Laurent began the class giving us the history of macarons. To my surprise macarons are originally Italian and purportedly were created by Italian monks, evidence of macarons goes as far back as the 1500's. So how did macarons become so popular in France? The story goes that when Catherine de'Medici married King Henry II she brought the technique with her to France. French nuns were famous for making macarons and in that way they became very popular in France. The next part was dedicated to the five different types of macarons we would be making and tasting that evening. The first macaroon was the American coconut macaroon. Laurent demonstrated at the front the technique of making the macaroon, a piping bag is essential for most macaron making. 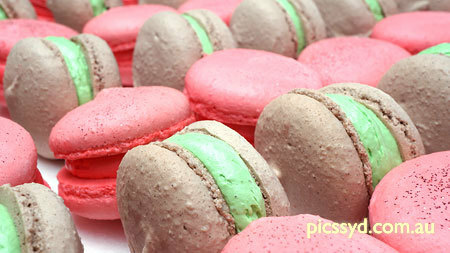 With the piping bag you must take care to make all of the macarons equally, as the mixture easily comes out of the bag. If they are made unequally some will take longer to cook and others will burn. At the end of the coconut macaroon lesson Laurent passed out the delicious American coconut macaroons which were moist and delicious. I think everyone agreed it was a favourite. Next came the Amaretti Italian Macaron which was created 500 years ago. I found this one much less intimidating as you don't need a piping bag and can make the macaron by hand. You pinch cute little corners on the top of the dough to make a pointy tip and dust it with sugar. Sounds fun, doesn't it? This was my personal favourite, I loved the almond taste of the Amaretti macaron. After that came Macaron of Nancy, which is a simple almond macaron again dusted with sugar. The name comes from the Sisters of Les Dames du Saint Sacrement's Convent who made the macarons in the downtown of Nancy, a town in the Lorraine region of France in the 1800's. Macaron of Nancy put macarons on the map. As Laurent was cooking he encouraged students to get up and assist him in making the macarons and practising with the piping bag. Macaron de Paris with French Meringue was next on the list. They were dyed a lovely raspberry colour with a delicious berry jam in the middle. And finally came the Macaron de Paris with Italian Meringue. These macarons are the popular ones we see around town and by far the most complicated to make. They are made with a butter cream filling which is wickedly good. While I'm not sure I will be making macarons at home anytime soon (besides the Amaretti Italian Macaron) I thoroughly enjoyed the experience of learning how they are made, the fascinating history behind the delicious treat, and seeing Paris International Cooking School, which offers more in depth macaron making classes and many other types of cooking classes. If you would like to have a fun evening with friends learning how to make and tasting delicious macarons go to the Macaron Making Party, you won't be disappointed. Why? Who doesn't like eating macarons?